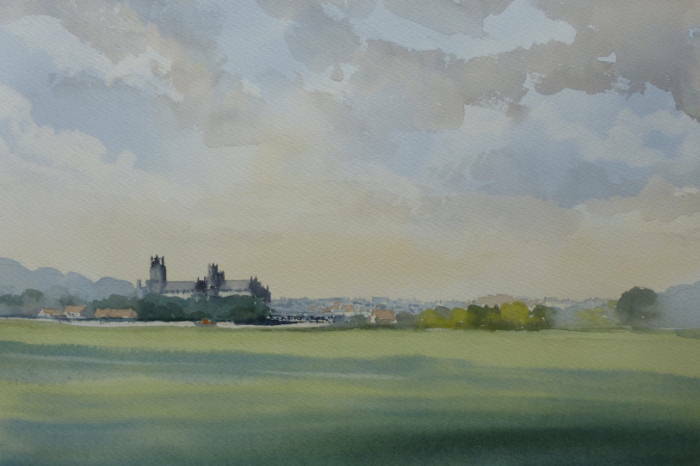 My work encompasses a range of subjects, but is mainly landscape based, often featuring big skies and wide open spaces. My preferred medium is watercolour, sometimes used with ink applied boldly with a brush, but I also enjoy working in oils. I love to be out in the landscape, and can often be found trudging the footpaths of Norfolk and beyond, always with a sketchbook and camera in my rucksack. The inspiration for my paintings often comes from some fleeting effect of the light that I've glimpsed on one of these trips. Over the years I have done a great deal of art tuition, which I really enjoy. I am available for workshops and demonstrations to art societies, private art groups, or commercial art centres. I also offer one-to-one and small group tuition at my Dersingham studio. Full details of demonstrations and tuition here. As designer of the current WNAA website, I offer a complete website design and construction service to other artists, or any small business. You are welcome to contact me on any aspect of my painting, tuition or website work. I am always happy to receive visitors at my studio in Dersingham, but please telephone or email to make an appointment. All images on this page copyright © Artist Name 2017. No images or other content may be used without the express permission of the West Norfolk Artists Association or the individual artist.